Together, we cycled through intense cold, heat, dust storms, a snowstorm, and even encountered some rogue yaks. 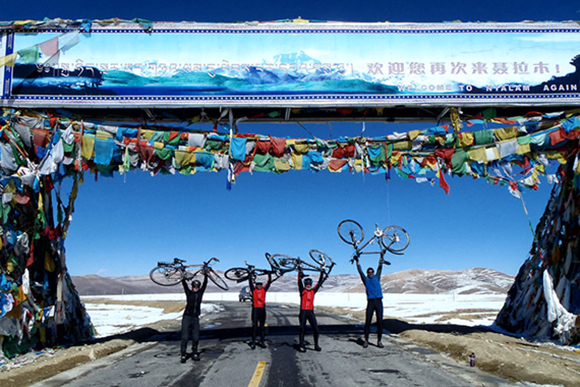 As part of a sixty-five hundred kilometer bike tour through China and Southeast Asia, I decided to cycle the Friendship Highway, an eleven hundred kilometer route crossing Tibet from Lhasa down to Kathmandu in Nepal, with a side trip to the Everest Base Camp. I did this trip with Heidi and Marianne from Denmark and Gigi from Italy, all of whom I had met through Lonely Planet’s Thorn Tree traveller’s forum. The Chinese government forbids one to cycle independently in Tibet, so we were accompanied by a local guide and driver. Tibet hosts one of the most beautiful and extreme environments I have ever encountered. Together, we cycled through intense cold, heat, dust storms, a snowstorm, and even encountered some rogue yaks. To top it off is the lung crushing altitude. We were rarely below four thousand meters and cycled up five passes over five thousand meters. Last, but certainly not least, the cyclist’s nightmare – soul smashing headwinds. On a bike you can really feel the landscape, often in pain, while grinding up a thirty kilometer climb, but it’s the reward of reaching the top of the pass adorned by thousands of prayer flags and cruising downhill at top speed that really makes you feel alive. The first cycling day out of Lhasa was nothing to write home about. We had enjoyed our three days stay in the city, exploring the Potala palace and the old Tibetan quarter. There was also a lot of frantic running around to get supplies for the trip. At this point our bodies had adjusted well to the altitude at thirty six hundred fifty-eight Meters. We left Lhasa on October 7th, 2011. I fell in love with the stark beauty of the high altitude desert, impossibly blue lakes, and stunning mountain panoramas. There are many scenes of the trip that remain unforgettable in my mind. But there is one that particularly stands out for me: Yamdrok Lake. Tibet had always interested me, but when I first saw a photo of this incredible lake, I knew I had to go. It was on day two when I unexpectedly laid eyes on this lake. This was one of the toughest days of the trip for us. At the start of the day, we fell into a good rhythm passing through several traditional Tibetan villages. Rosy-cheeked children peered out by the roadsides to check out the crazy foreigners on bicycles. The weather was perfect with sunny clear skies at around twenty degrees Celsius. As we climbed higher and higher, we really started to feel the altitude. All developing screaming headaches, breathing became much more difficult. We often stopped to catch our breath and to take in the magnificent landscape around us. Our progress was measured with the never-ending switchbacks snaking below us to the valley floor. Eventually, Marianne and I got a little bit ahead. She was in front of me and following her was what kept me going. Then, in the distance, we spotted the sign of the end: prayer flags. We were elated and pushed on to the finish. It was the hardest hundred meters of pedaling in my life. I have never felt such body numbing exhaustion. 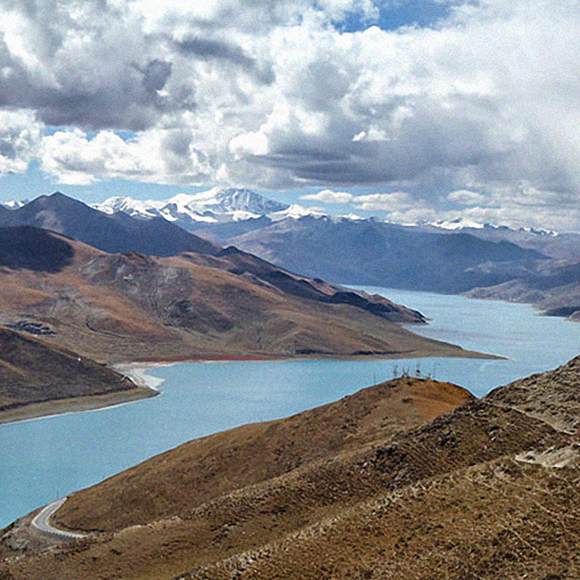 Then, as we crested the top, I was awarded with one of the most incredible sights of my life, Yamdrok Lake, considered one of Tibet’s holiest lakes. The lake is so blue, it looks like it were photo shopped, surrounded by high peaks. The following day, we crossed Karo-la, our first pass over five thousand meters. Marianne and I had developed severe coughs, likely the “Khumbu Cough” that you get from being at high altitude. That would last the duration of the trip. Our headaches, however, had disappeared and never really reappeared after day two. The scenery along the way never ceased to amaze us. Glaciers, dry mountains, villages, sheep, and yak dotted the landscape. Soon, we crossed the Gyatso-la pass, the highest of the trip at five thousand two hundred twenty meters. It is said amongst cyclists to be the toughest pass because of its insane headwinds. This was no exaggeration. Gigi described it best when he said “I felt like I was going backwards when I was pedaling.” One day later, we had our first view of Everest from the road. Three days later we would reach Everest Base Camp. We turned our bikes off the smooth tarmac of the Friendship Highway and onto the rocky dirt track towards Everest Base Camp. The bumpiness of the road made the cycling incredibly slow. I was riding a touring bike and the lack of suspension was punishing to the upper body. Marianne, Heidi, and Gigi had the right idea with their mountain bikes. We crossed the Gu la Pass and we were awarded with an incredible panorama of the Himalayas at the top. The descent, like the climb was painfully slow. Gigi, however, was relishing every moment with his brand new front suspension bike. He raced down ahead of us. 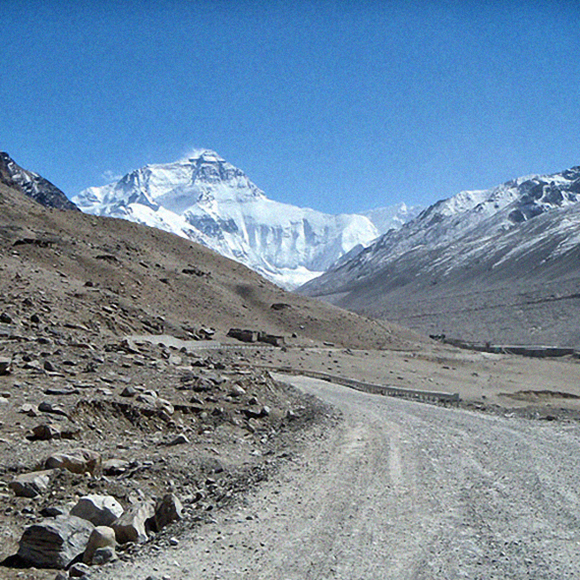 I remember when I had the first view of the mountain as I approached Rongbuk. It was a sight to stop anyone in his or her tracks. There stood the North Face of Everest, massive and gleaming white, without a single cloud to obstruct the view. Definitely a sight I will remember for the rest of my life. 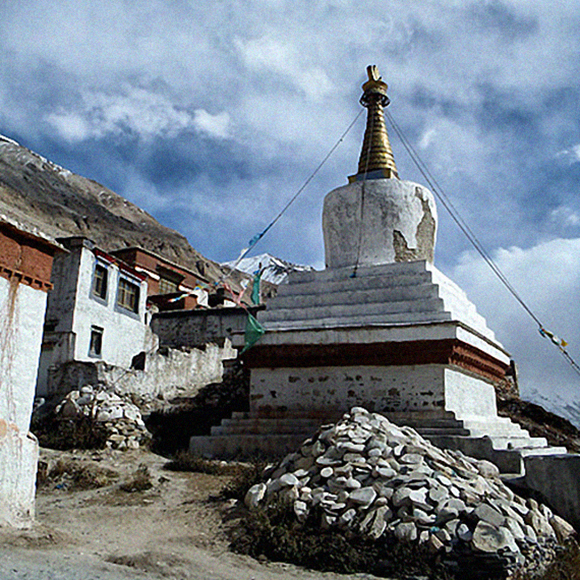 Rongbuk consisted of a monastery and a guesthouse. Rongbuk monastery was constructed by the locals in 1899, and at around five thousand meters is the highest in the world. The next day I ate a Tibetan breakfast of tsampa (roasted ground barley mixed with yak butter tea) and we pedaled to Everest Base Camp. The weather was rapidly changing and we didn’t have the crystal clear view of the mountain we had the previous day. There was a bit of a misunderstanding with our driver, which left us waiting at a police checkpoint for our permits for over an hour. Still, it was a day we had been looking forward to since the beginning. We could now say we had cycled to Everest Base Camp. The next day, the weather took a turn for the worse. We cycled in a full on blizzard for about twenty kilometers. Eventually we had to call it quits because our van was inadequately equipped with its summer tires to cross a snowy pass. We had planned to take a shortcut back to the Friendship Highway, but suddenly this wasn’t possible. At this point we had to jump in the van and take the long way around, backtracking the way we came. By now the days had grown very cold and we gave up camping for Tibetan guesthouses. The accommodation was extremely basic. It was dormitory style with dirt floors and Tibetan pit toilets – basically a couple of square holes carved into a dirt floor. Rustic as it was, I enjoyed this simple way of living – warming myself by the fire at the end of a hard day sipping Tibetan sweet tea. At this point in our trip, we were craving the warm weather of Nepal. The mornings were freezing and we were stopping every couple kilometers to do jumping jacks and frantically clap our hands together to generate heat. From here on the passes became easier. One day we met an unusual traffic jam – a large group of yaks. They were rather uncooperative, unwilling to let us pass on our bikes. One of them even tested Marianne by bluff charging from the back. Eventually, we politely inched our way through. When we crossed our last high pass, the Tong-la, we were overjoyed. It was a stunning ascent, with the valley and distant peaks covered in a light blanket of snow. We were met by a crowd of cheering tourists at the top, echoing our own shouts of victory. From here, it was all downhill to Nepal. A very long downhill at that – the longest in the world dropping twenty eight hundred meters into the Nepal valley. The scenery changed rapidly. Frozen glaciers and mountains gave way to rushing waterfalls and lush vegetation. Freewheeling into warming temperatures was absolute bliss. We were suddenly overwhelmed with oxygen again and felt like super humans. That night in Zhangmu, the Chinese/Nepali border town, we were acting like giddy children. Giddy with too much air, giddy with the excitement of what we had just experienced. We flew up and down the green hills of Nepal into the chaos of Kathmandu. I already missed the silence and vast, empty landscapes of Tibet. Still, we were grateful to be there. It was really and truly the ride of my life. This is friggin AWESOME Tara! Kudos to you…look forward to more:) Love R.
Tara I have enjoyed reading this article several times. The photos are beautiful that captivate this amazing experience! Well done my beautiful daughter! xo! My Tara-Li- I knew when you arrived on this Earth you were meant to join with her and do great things. Thus far you have exceeded any previous visions. You are AMAZING my girl and We… Angels and Spirit… could not be more proud of you. I know within you – You have only been testing the way…. Thank you for a great article. By reading it we relived it all over again. What a fab article and BTW you’re a GREAT writer!!! I can’t wait to see and hear more of your adventures………you’re a true pioneer! Well written Tara. You put me right back there in the headwinds, thin dusty air, ridiculous cold nights and an experience I will always cherish. I laughed and cried lots on the trip.